This year’s judges for the seven categories of awards for beer writing were: Simon Jenkins, winner of the 2010 Beer Writer of the Year title; Fiona Matthias, executive editor of The Sunday Telegraph; Martin Ross, journalist, writer and home brewer; Martin Kellaway, founder of Wharfebank Brewery in Leeds and Joanna Copestick, who has commissioned and published a number of books about beer. To be in a room of 230-plus stunningly talented people, many of whom I’m so proud to call my friends, was breathtaking. 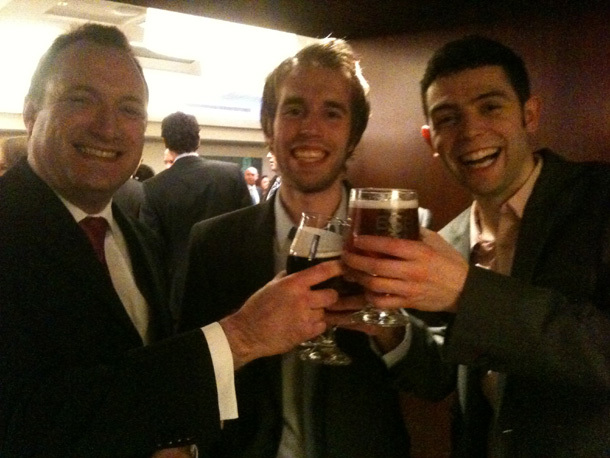 And also to be in a room with representatives from some of Britain’s finest breweries (who served beer at the pre-dinner drinks reception), sponsored the various awards categories, pub operators and others who support the beer & pub industry in a myriad of amazing ways was a true privilege. 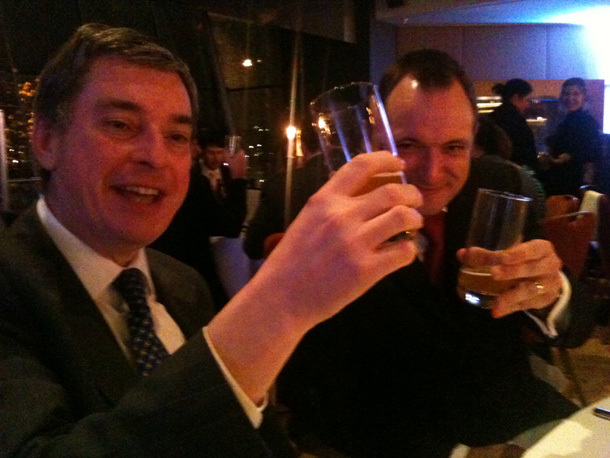 The Hubz and I were mega impressed by the drinks reception – Molson Coors, Adnam’s, Thwaites, Shepheard Neame to name a few offering a little libation with some delicious canapés. You can guess where we made a beeline for first, right? Getting up close & personal with some ESB. Of course. And thanks to Fuller’s who kindly asked us to sit on their table. A fabulous time was had by all. I heart Head Brewer, John Keeling. Then again, so does The Hubz. 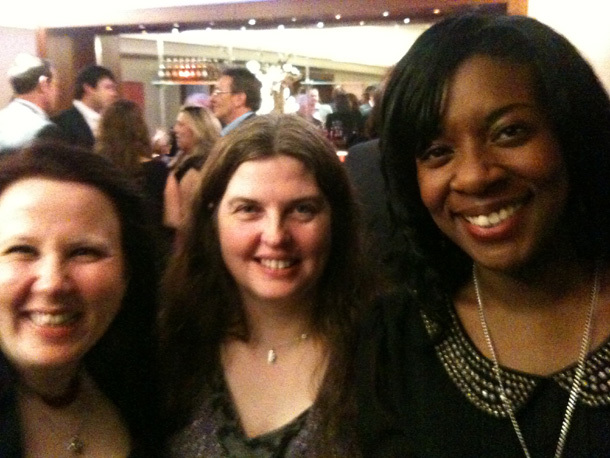 Of course, our dinner wasn’t just any old awards dinner. 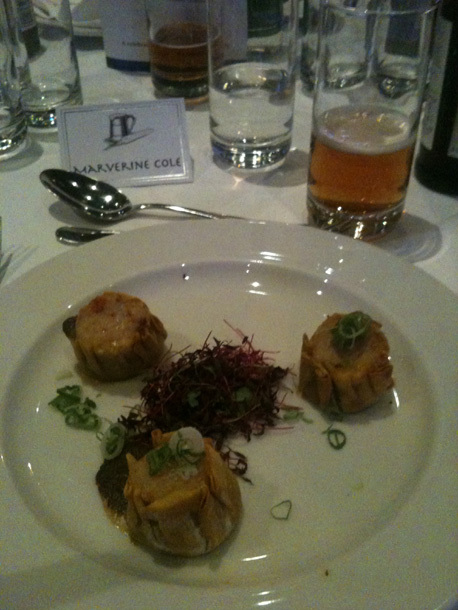 Each course of food was matched to a different beer, each one carefully thought-through by several Guild members (SCROLL DOWN FOR MORE FOOD AND BEER pics!). And after the dinner, last year’s winner of the Beer Writer of the Year, Simon Jenkins, took to the stage and announced the winners of each categories. I know Simon was a little nervous before getting up on stage to do the daunting task of presenting, but I also knew he’d rise to the challenge well and he didn’t show nerves when he was up there. In fact he was mega cool and did a wicked job. 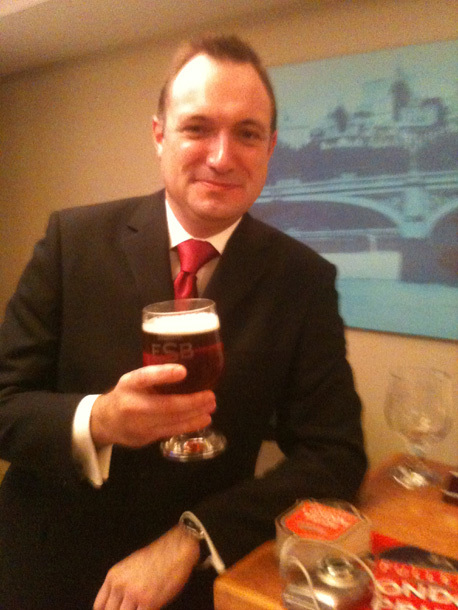 This year’s Beer Writer of the Year was the gorgeous, funny and incredibly talented Ben McFarland. I first met him a couple of months ago when he was judging the Sainsbury’s great British Beer Hunt. He’s so lovely, seriously cute and hilarious. 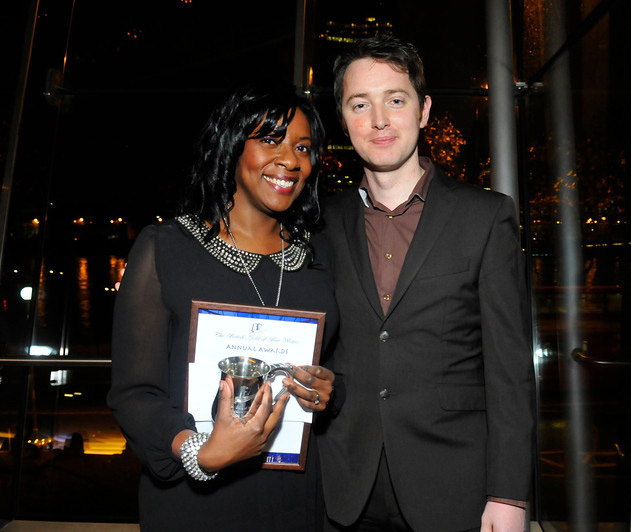 Click HERE to have a listen to Ben chatting to me after he collected his award. 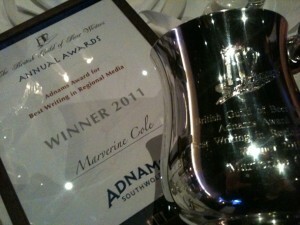 So I won the Best Writing in Regional Media (which also allowed Broadcast TV and/or Radio). 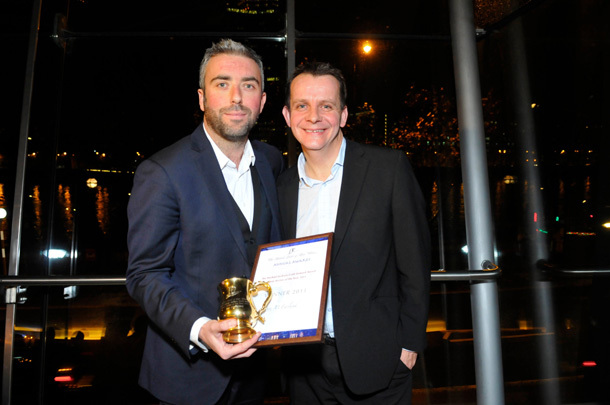 The award was sponsored by the fabulous Adnams and I was handed my award by Head Brewer Fergus Fitzgerald, who I’ve had the extraordinary pleasure of meeting and spending some incredible time with at the Adnams brewery and distillery in Suffolk earlier this year. Cheers to everyone who whooped and hollered in congratulations for me too. It was an awesome experience. Thanks to all the judges who deemed my TV feature to be a worthy Gold winner. 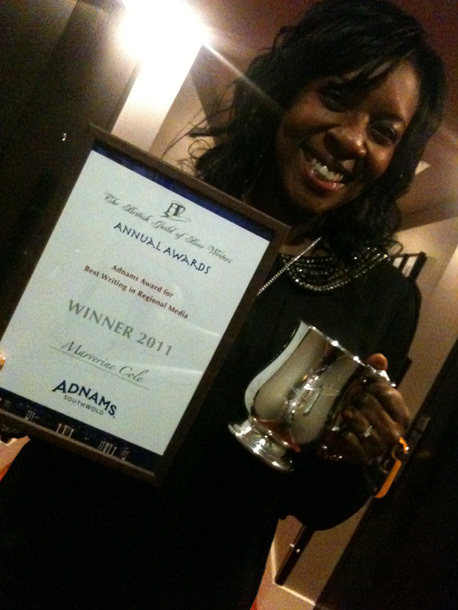 I can’t thank Adnams enough for sponsoring the category that I won and donating such a generous prize. I’ll treasure my Silver Tankard till the end of my days!! It’s now pride of place on the mantelpiece in my living room. I’ve listed all the winners and Special mentions (those who were in close contention for Silver awards, I got a Special Mention last year for the Best Online category!) below. 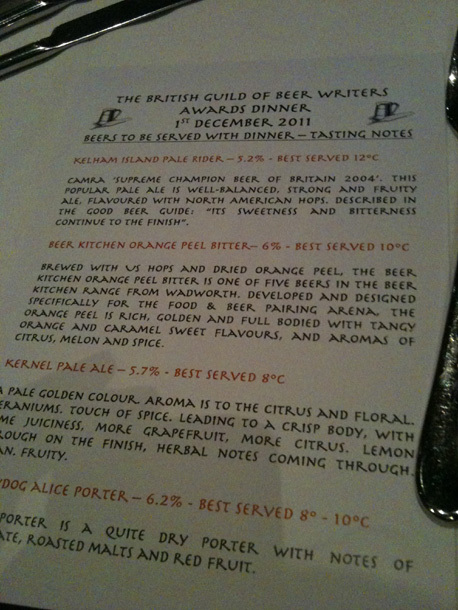 And attached is the link to the Beer Writers Guild press release of all the detail. 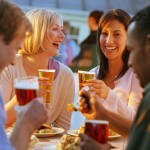 Budweiser Budvar John White Travel Bursary – prize £1,000 plus trip to Czech Republic . Winner: Des de Moor (BTW Des reckons he and I blew the Clap-o-Meter wide open when we each won! Lol); Special Mention for my new chum, the super-talented Mark Fletcher who writes Real Ale Reviews. 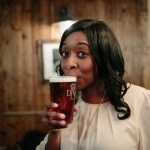 Shepherd Neame 1698 Award for Beer and Food Writing – prize £1,000. Winner: Mark Dredge; Special Mention went to another lovely new mate of mine, Jerry Barlett. The Hubz and I had an amazing time, met some wonderful people! Sophie Atkins (journalist), Ann Wedgwood (Hardknott Brewery) and me! Here’s a reminder of what I won for: the BBC Inside Out feature I researched, produced and directed last year about the importance of women to the beer industry. Have another look if you’ve not seen it. It features Pete Brown and many more fab industry peeps. 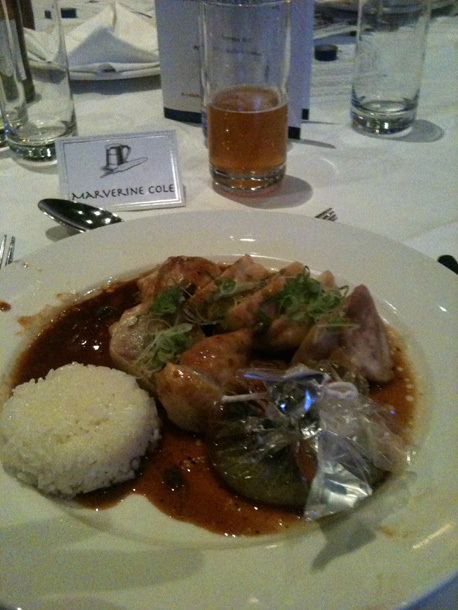 Plus here are lots of pics of the FOOOOOOOOOOOOOOOOD from the night (apologies for all the dark shots, iPhone 3GS with no flash. I gotta gets me an upgrade!) 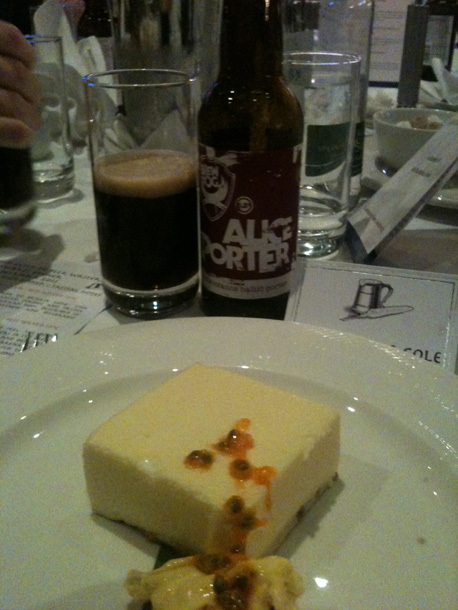 I totally forgot to take a pic of the 1st course with the Kelham Island Pale Rider – OOPS! But here are our other 3 courses! KEEP CALM AND DRINK BEER! 6 Responses to Holy Smoke! 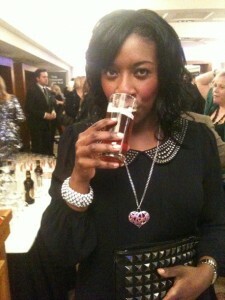 I won a Beer Writers award! I can tell by the way you have written this and the way you were on the evening, that you were as genuinely pleased and surprised and kind of overwhelmed to win as I was last year. I may now longer be Beer Writer of The Year, but I am now, apparantly “mega cool”, something I have always aspired to but have never before achieved. Have a great year, gorgeous. Wow, congratulations! How exciting. It’s a warm, fuzzy feeling to be acknowledged by the peers you respect for work you love doing, isn’t it? What a lovely pre-Christmas present for you. I’m sorry I wasn’t there too, Marverine. Never mind, we will meet one day. Meantime, I note three out of the 11 winners had the initials MC – well done us!